I coached kids football for five or so years with my mate who was one of the other parents. Together, we took our team to win their league at Under 12’s. It was quite a proud moment. The reason I stopped was that in that same season I had a genuine death threat from an opposition parent (who our team had beaten) which was a little unsettling to say the least. It’s kids football, it’s not really that important is it? But football is now in general decline at grass roots level for exactly that reason. The fun has gone and for many parents it’s a desperate chance for a ticket out of poverty. Winning is everything and if their son or daughter is the next big thing, they’re made for life. Statistically, football is the sport that it’s easiest to get rich at. Assuming the top two leagues are generally pretty wealthy, then you have around 500+ players earning mega money in the UK alone. Add in the other European Leagues and the rising Far East markets, and it’s comparatively easy. In golf or tennis, this may only be the top 50-100 in the world. But this week, Sport England announced it has cut FA funding by £1.6m after a grassroots decline. Football is in trouble. Never before has the professional game been so completely disconnected to the grass roots game. Unless they address this, the game will just slowly wither and die. There won’t be the players coming through to feed the national teams and there may not be those growing up with football as part of their life as were were. 1. Make football fun again. Don’t play competitive football until they get well into their teens. 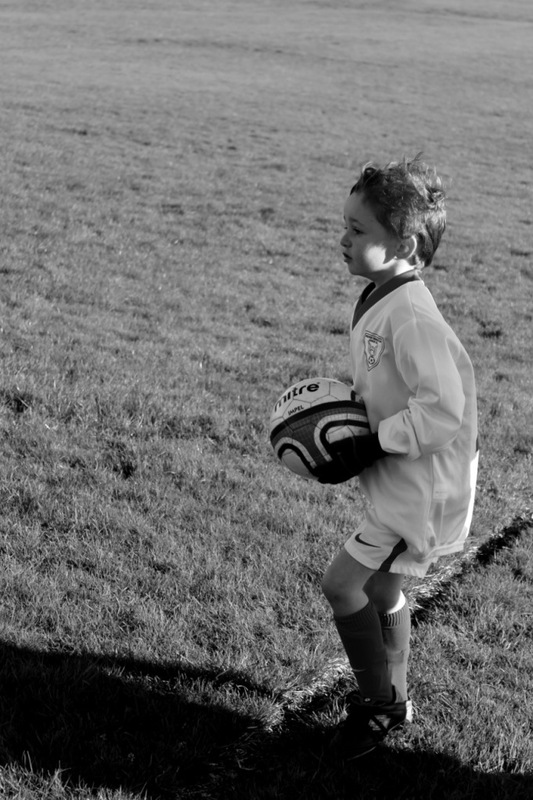 Kids want to play football with their friends, they don’t care whether they win or lose, It’s the parents who do. They’ll play their competitive games in the playground anyway, without their parents screaming at them and taking the fun away. 2. Build respect into the game from the outset. The FA are now attempting to teach this to the kids, but they need to keep the parents away as normally that’s where the problems lie. 3. Keep the game sizes small so all the kids get lots of time on the ball to raise their overall skill levels. The more they play the more they will improve and in theory the more they should want to play. 4. Stop players in the professional game from swearing on the pitch and saying anything AT ALL to the referee. Look at rugby for a model here. It’s flawless and everyone calls the referee ‘Sir’ as they have ultimate power on the pitch and off it. I don’t really care about England games anymore, I’m not even that bothered about the Premiership. I’ll always be an Oxford fan, but my love for the game and more importantly, it’s future as a national sport is in jeopardy unless they change the way the game is played at the very bottom of the footballing pyramid. ps, Thanks to Ruby Lyle for the image of Charlie G.
A while ago I laughed at O2 for trying to get down wiv da kids and getting it horribly wrong. What they did was try to speak in the voice of their audience rather than in the voice of their brand . 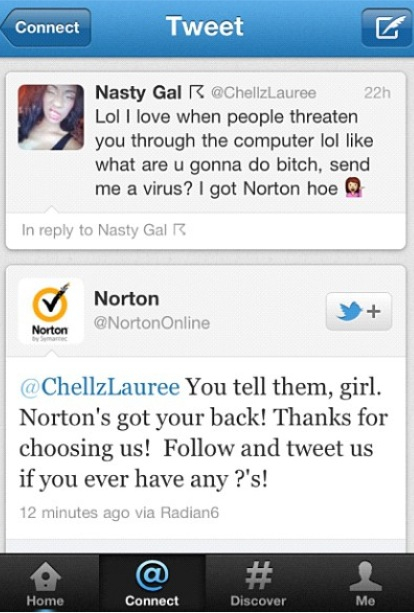 Norton, on the other hand have stuck to their script and still intervened with one of their customers. This is a far cleverer way of handling it and shows a great choice of strategy for social media. Nice one Norton.